Queen Mathilde of Belgium and King Philippe of Belgium at the arrival of the Belgian Royals for a state visit to Japan at Haneda airport on October 10, 2016 in Tokyo, Japan. 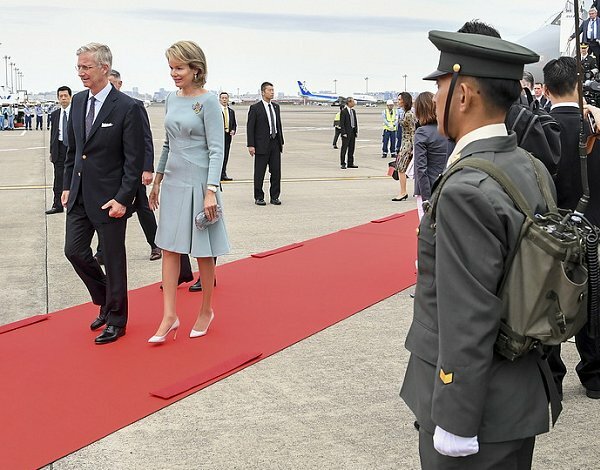 Belgian royal couple are now in Japan on a six-day visit as the state guests. I really like this dress, it has interesting design and lovely color. Also love the brooch. Simple, classic and elegant. Well done! Simple elegance, just lovely. If only her hairstyle would be less stiff. Nice color and the dress style. In my opinion she should have worn the dress she left Belgium in. The colors would have been more fitting for the trip. 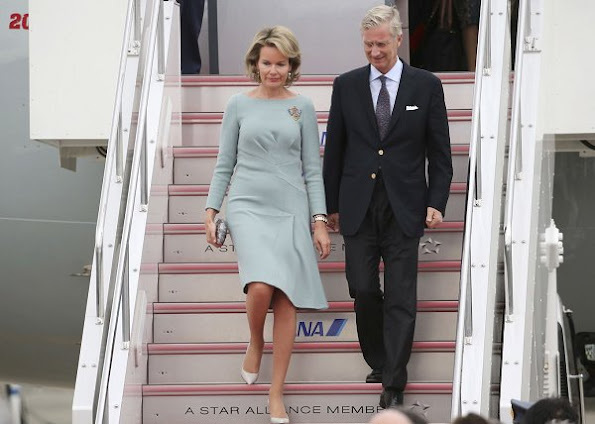 The dress must be Natan, it reminds me of the one the then new Queen Máxima wore to Spain. She has such a classic elegant style. Well done!